After Dour Report, Hegar Says Moody's "Should Know Better"
Comptroller Glenn Hegar launched a torrent of criticism at Moody’s Investors Service on Thursday after the credit rating agency released a report suggesting a drilling slowdown could eat up a projected $4 billion budget surplus by December. 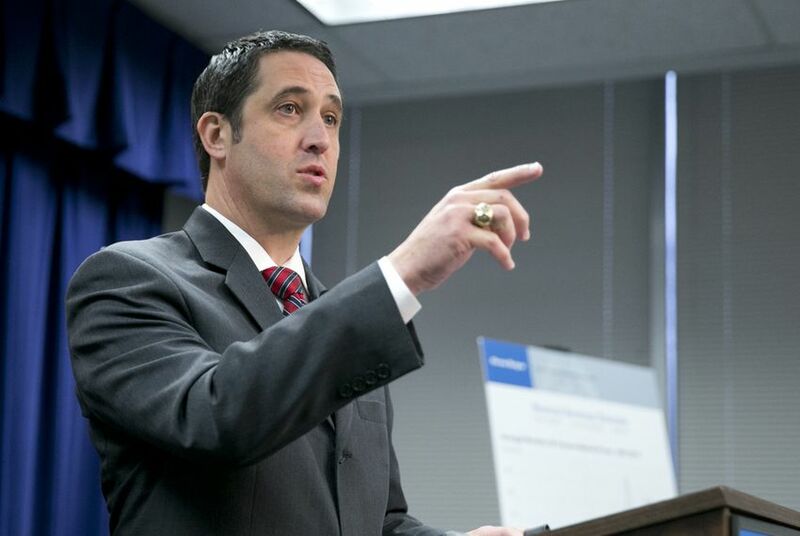 Texas Comptroller Glenn Hegar launched a torrent of criticism at Moody’s Investors Service on Thursday after the prominent credit rating agency released a report suggesting that the state's drilling slowdown could eviscerate a projected $4 billion budget surplus by the end of the year. The Republican called the Moody's report “an oversimplified, back-of-the-envelope calculation based on unfounded assumptions." “Moody’s should know better,” he added. That statement came just hours after the prominent credit ratings agency released a report that largely echoed the same point Hegar has made to lawmakers and the public in recent weeks: that Texas, with its diverse economy and conservative budgeting, is better positioned than other energy-producing states to weather a prolonged crash in oil prices. The report went on to suggest that a standstill in the oil patch could stall tax collections enough to shrink the state’s projected $4 billion budget surplus to zero in a matter of months. That surplus is separate from the state's Rainy Day Fund, which is fed by oil and gas severance tax revenue and was projected to end the current biennium with a $10.4 billion balance as of October. "Absent any spending cuts, the budgeted cushion would be depleted by December 2016 if sales tax collections remain at December 2015 levels and outflows continue to exceed forecasts at a similar pace,” the report said. Such an outlook runs completely counter to Hegar’s assessment, which is neither particularly rosy nor gloomy. “I want there to be no confusion: The current budget works even with oil prices at recent lows,” Hegar said. “In fact, the initial draft Moody’s sent to my office for review contained several errors, and my staff had to make substantial corrections." Hegar took particular issue with the ratings agency’s suggestion that sales tax collections could linger at December 2015 levels throughout this year. “Taking a single data point and using it to extrapolate a year’s worth of budgetary information for the 12th-largest economy in the world is irresponsible and inflammatory,” his statement said. David Jacobson, a Moody's spokesman, said the agency stands by its report. Hegar’s latest forecast includes 1.2 percent growth in sales tax collections during the 2016 fiscal year. But collections in the first four months of that year, which started in September, were down 2 percent compared to last year, the Moody’s report said. Sales taxes make up nearly two-thirds of the state's tax revenue. During last year's legislative session, Hegar told lawmakers that they had $113 billion in general revenue to work with. Budget writers intentionally left several billion dollars of that unspent, partly out of an abundance of caution in case a protracted oil bust hit the state's economy harder than expected. In October, Hegar released an updated revenue forecast that predicted the state would have $4.22 billion in the bank at the end of the biennium. The Moody's report noted that Hegar's last forecast of average 2016 oil prices — made last October — was $16 above what the credit ratings agency projected this month. Hegar's 2017 forecast was $19 above Moody's current projection for that year. Correction: An earlier version of this story incorrectly stated how much the Comptroller's office projected that the Rainy Day Fund would reach at the end the current biennium. It also incorrectly stated that Comptroller Glenn Hegar's forecast of 2016 and 2017 oil prices were, respectively, $16 and $19 below Moody's forecasts. Hegar's forecasts were above Moody's forecasts by those amounts.